Have you been thinking about starting a blog for many months now? Maybe for a year? Or did the thought of starting a blog just pop into your head a few moments ago? It doesn’t matter which category you fall into—today is the day! It’s time to start your blogging adventure, and I’m so excited for you! I’m going to help you get that amazing new blog of yours up and running right now. Yes, right this very second! I’ll hold your hand for these first steps and walk you through exactly what you need to do. Together, we’ll set it up and launch your blog. In just 30 minutes (or even less! ), you’ll have your own URL, blog name, and website. This is the most exciting part of your new blogging adventure! What you select will be both the name of your blog and your URL. Mine is “Amy’s Healthy Baking…” What will yours be?? Your potential blog name could be cute, fun, or whimsical… It could describe the type of food you intend to share… It could involve your name or nickname… I highly recommend that you brainstorm many possibilities to start! Take a bit of time to write down some blog names, and decide which one or two are your favorites. Once you have that list, let’s head over to BlueHost. We need to make sure your #1 blog name is available! The best URL matches the title of your blog—without any hyphens, underscores, or other extraneous characters. 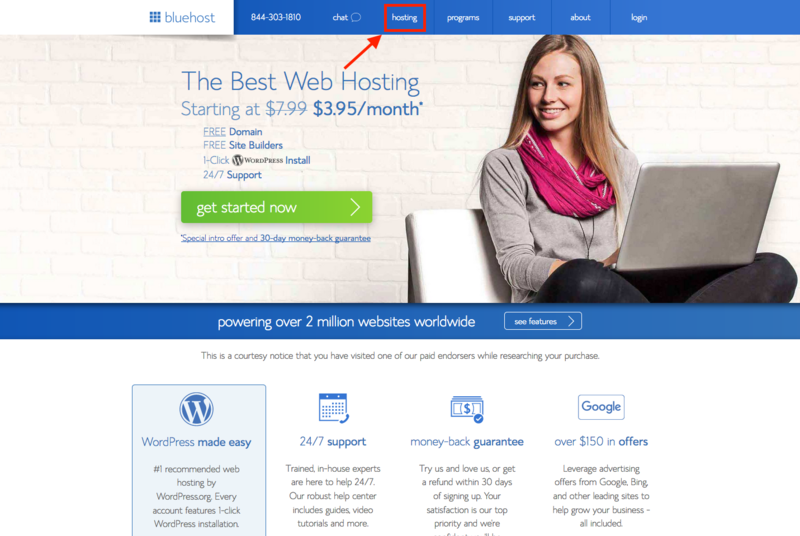 When you visit BlueHost’s website, let your mouse hover over the word “hosting” at the top of the website (white text over a blue background). A drop-down menu will appear. Click on “domains” at the bottom of that menu. When you see the screen below, type in what you’d like your blog name to be. 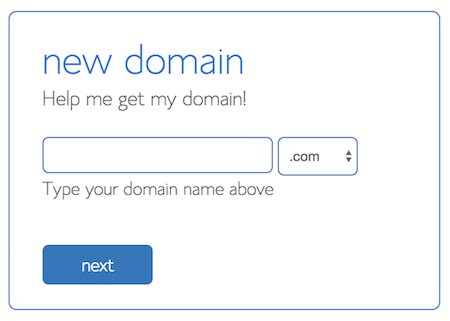 Note: If “yourblogsname.com” is taken, try the .net or .org options from the drop-down menu first before changing your blog’s name or adding extra characters. When you see the following screen, do a little happy dance. (I’m doing one right here with you!) This is so exciting—you’re well on your way to starting your blog! Step 2: Pick a host. A host? You might ask. What exactly is a host? Don’t worry; I had the same thought when I started my blog! Think of the host as a humongous filing cabinet. It’s going to store all of your delicious recipes and pretty food photos! I picked BlueHost as my hosting company, like the majority of other food bloggers, and I absolutely love their company. I highly recommend using them for both your URL and your host! 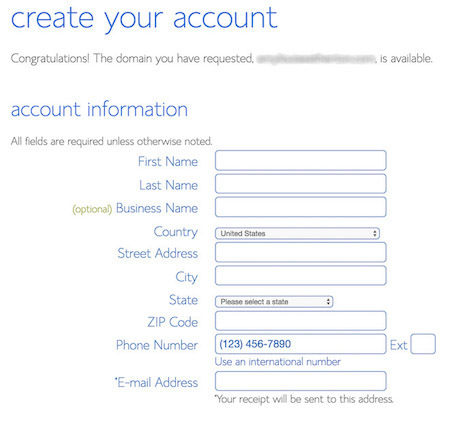 You should see the following screen after filling out your information for your URL. 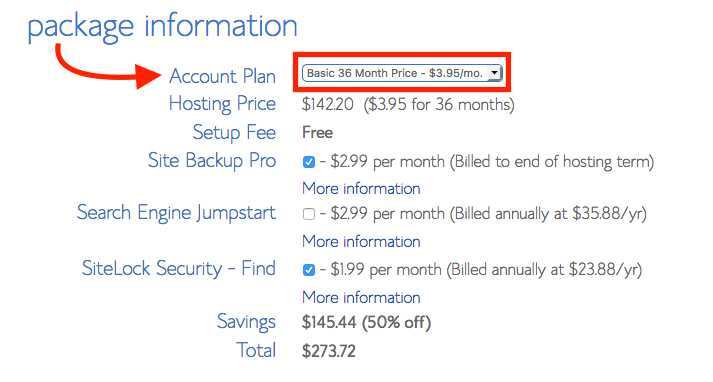 If you sign up now, you’ll get your URL for free for the first year if you select BlueHost as your host! I highly recommend the 36-month option. Yes, it’s a decent amount to pay up front, but you’ll save a lot more money in the long run. Besides, that monthly price is basically the cost of one latte or frappuccino from your favorite coffee shop—not very much at all! 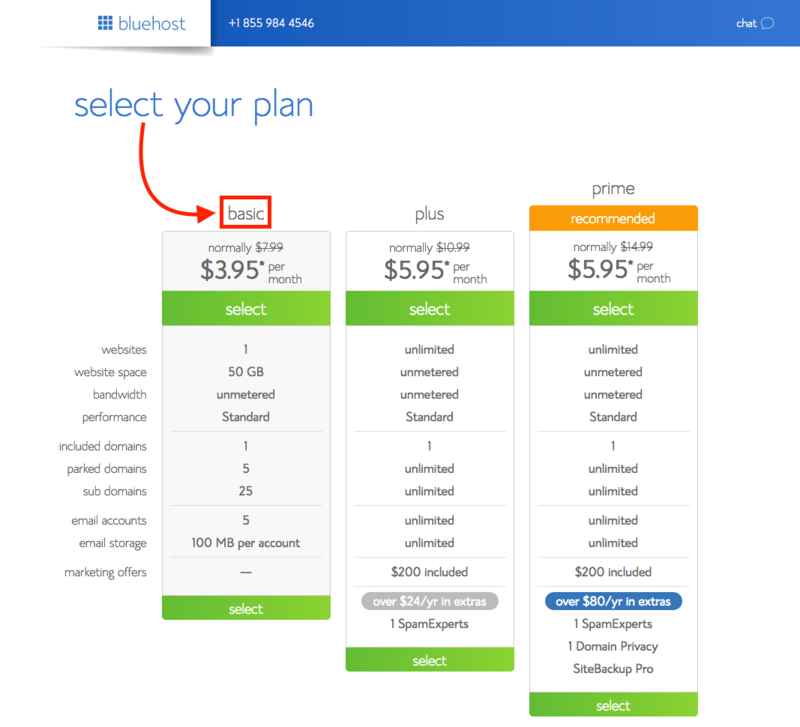 When I chose BlueHost as my hosting company, I also included the Domain Privacy Protection. It’s a great service and completely worth the additional $0.99 per month! Congratulations!! You now have your own blog! Great news—this part is free! To set up WordPress in BlueHost, click on the cPanel tab at the top, or “homepage.” Scroll down to “Website Builders,” and click on the WordPress icon. 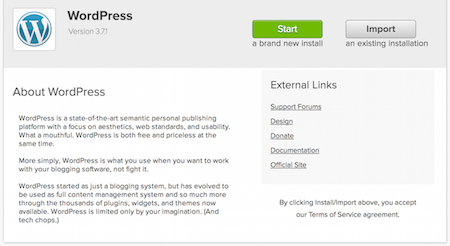 On the page that appears, click the green “Start” button. When the installation is complete, write down the following information: Site URL, Login URL, Username, and Password. (You may change the password later.) In a new browser window, copy and paste the Login URL. 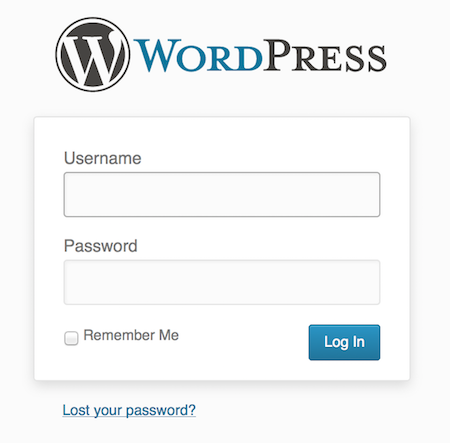 When the login screen below appears, type in your Username and Password. Step 4: Make your blog pretty! If you’re willing pay a little bit more, there are lots of gorgeous, already pre-customized selections offered with the Genesis Framework ($59.95) and Thesis Theme ($87). Many bloggers eventually switch to one of these and hire a designer to create a truly unique design. I currently use Genesis! I’m so proud and happy for you, and I can’t wait to see your new blog! Leave me a comment below, and tell me the name of your blog and where I can find you! *Disclaimer: Some of the links above are affiliate links, and I’ll earn a commission if you sign up for the service after clicking on the link. I included these because I love the companies and have used them myself, and I would highly recommend them regardless of the commission I may earn. Psst… My preferred hosting company for all new bloggers is having a special Fall Sale on Thursday, October 13! For those 24 hours, they’re offering all Amy’s Healthy Baking readers who create their own blog here an exclusive rate of $2.95/month! Psst… BlueHost is having a special Fall Sale on Thursday, October 13! 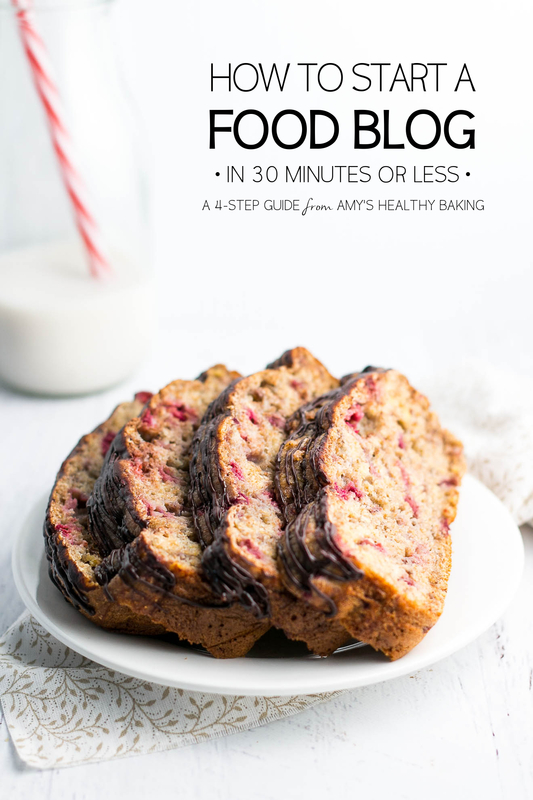 For those 24 hours, they’re offering all Amy’s Healthy Baking readers who create their own blog here an exclusive rate of $2.95/month!